Happy Easter to you. I know it is nearly all over, but we still have Easter Monday Bank Holiday ahead of us and, I'm certainly glad of that additional day to get over the clock change and recover from the over-eating. It wouldn't be Easter without some Easter baking. I've been away on holiday in the run up to Easter so there has been nothing to show. But as I had family coming round today, I whipped up some basic cupcakes/fairy cakes/ buns using Jo Wheatley's recipe in 'A Passion for Baking'. 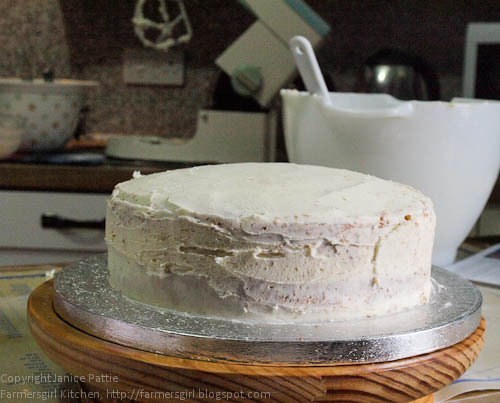 It's a rich cake mixture with 200g of butter, flour and sugar and three eggs. 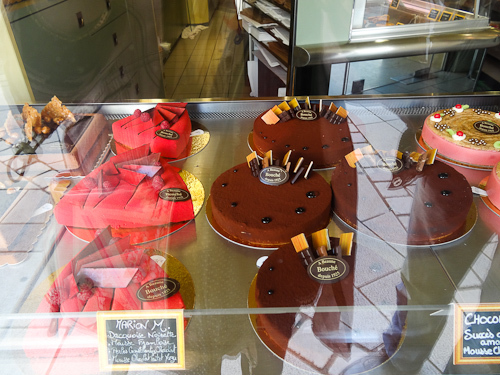 The bigger cakes turned out well, but some of the mini cakes went a bit oily which was a shame. I would probably go back to my Mary Berry - Fast Cakes recipe in future when doing the little buns. I used Mary's recipe for chocolate buttercream, a simple one of butter, icing sugar and cocoa powder whipped up together in my Kenwood Chef. A bit of swirly piping with a Wilton 1M nozzle and some mini eggs for decoration. 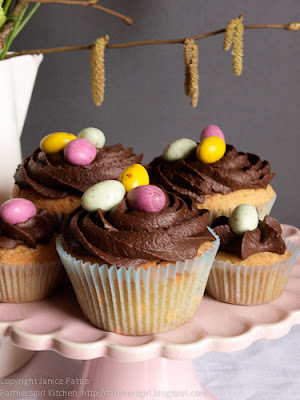 the theme for March is Easter Bakes. 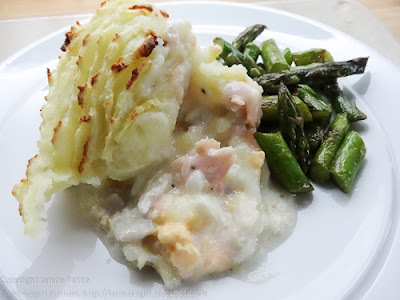 I can't remember when Fish Pie became our Good Friday tradition, well that's the thing about traditions, isn't it? You don't really plan them, they just grow from good ideas. 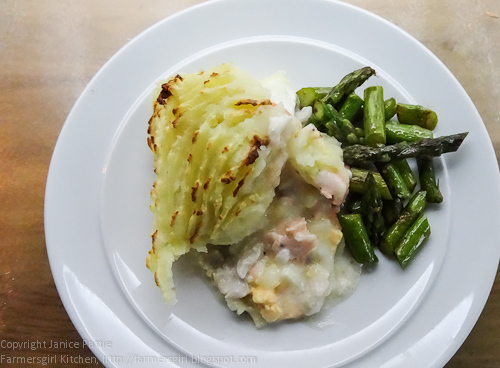 Over the years I've made a variety of different versions and, as I am taking part in the the Fish is the Dish, Healthy Happy Hearts campaign, eating two portions of fish for six weeks, it was an ideal way to get one of my fish portions. 2. 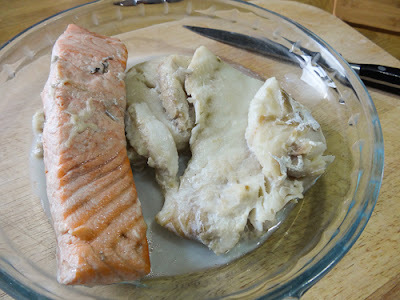 Poach the fish in 300ml milk with a tsp of fish stock powder. Poach for 15 mins until fish is cooked. 3. Lift out the fish and place on a plate to cool a little. 4. Flake the fish removing any bones. 5. Measure the warm milk used to poach the fish and top up to 500ml. 6. Mix cornflour with a little cold milk and add the cornflour mixture to the warm milk. 7. Cook until the sauce starts to thicken, season to taste. 8. Place the flaked fish in an ovenproof dish add the sliced hard boiled eggs and top with the raw scallops. As they don't take long to cook its better to put them in raw and they will be cooked in the oven. 9. Pour over the white sauce. 10. 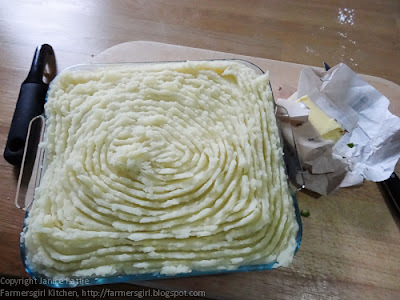 Cover the sauce with the mashed potatoes and fork up the potato to create crispy bits. 11. Place the dish on an oven tray and place in the oven for 15 minutes until the sauce is bubbling and the potato topping is golden brown and crisp. I served the Fish Pie with Asparagus, sauted in butter with a little water to create some steam. 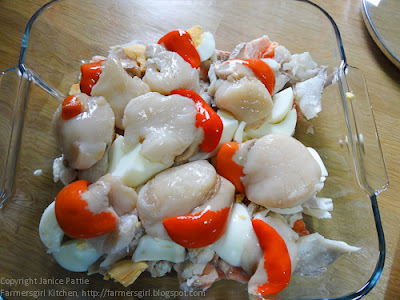 The fish was tender with the delicious, plump scallops adding a touch of luxury to this comforting fish dish. Find out more about the Healthy Happy Hearts 6 week plan. 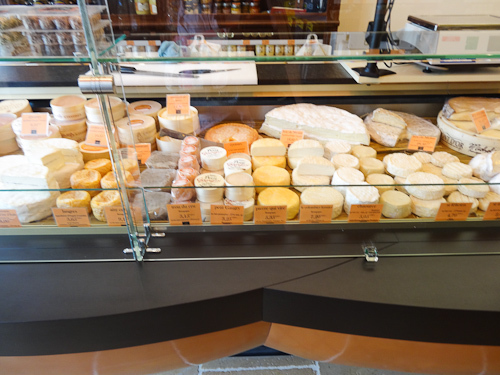 I've been in the South of France for the past week. Eating delicious food and taking photographs of more delicious food which I can share with you. 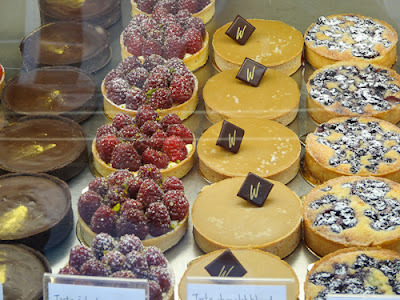 The photograph above show some of the delicious patisserie on sale in Beaune in the Burgundy region of France. 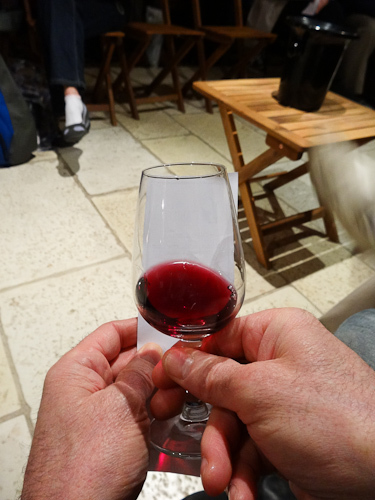 Checking the colour of the wine against white paper. 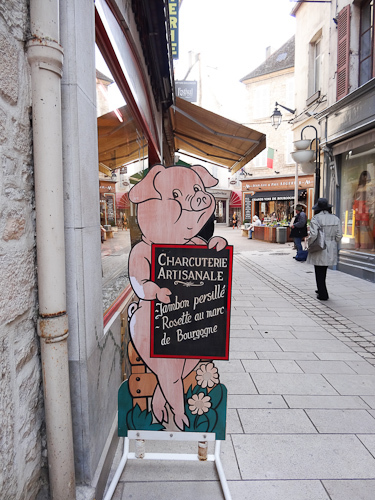 More French Foodie photos coming soon! The UK is partial to a morning coffee hit; but why are we so quick to reach for the instant rather than a simple fresh ground coffee? We love our coffee although we tend to go for tea first thing and start on the coffee for elevenses and then again after dinner in the evening. A recent survey by OXO shows that 6 in 10 of us prefer instant to ground coffee because of the hassle ground coffee poses, not just in preparation but in cleaning up afterwards too. That was until OXO took away all the hassle with their new French Press. 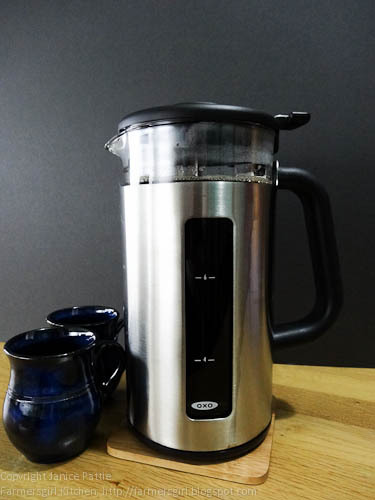 The French Press (£35) is a modern twist on the traditional cafetiere. Housed in a sturdy stainless steel and glass carafe, the innovative ladle ‘the groundskeeper’ catches and contains ground coffee in a jiffy, removing the used grounds in one simple step. For optimum brewing and the perfect cup every time, simply add hot water to your ground coffee using the measurement markings for guidance; stir, steep, plunge and pour. It can serve up to 8 cups, so when your friend pops round for a coffee, no need to re-brew. To clean forget banging, scooping or scrubbing; simply lift the groundskeeper out of its carafe, wash and drip dry. 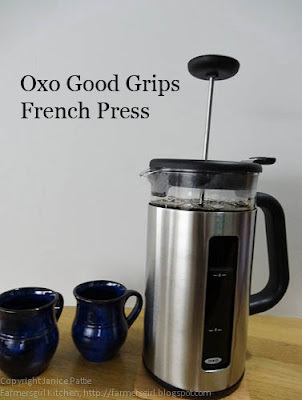 I was fortunate to be able to test-drive the Oxo Good Grips French Press along with a selection of Douwe Egberts coffee. We found the 'Fired Up' coffee a bit too bitter and strong for us, so we made our own blend, mixing it with the House Blend worked rather well for us. 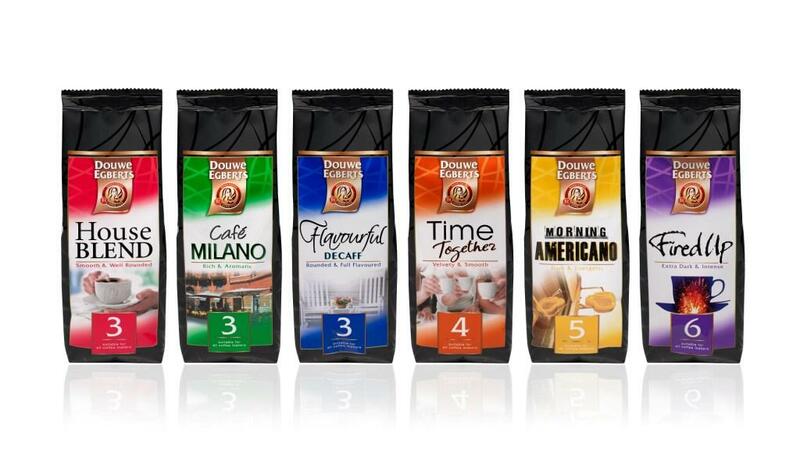 Douwe Egberts have put together 10 top tips for making great coffee in the French Press and I've added my comments! Warm your OXO French Press: You wouldn’t put hot food on a cold plate, so don't put hot coffee in a cold French Press. Pre-heating your French Press with boiling water keeps your coffee hotter for longer and improves the flavour. A cold French Press will add bitter flavours to your coffee. This is definitely a good tip, we still found that the coffee cooled more than in our filter coffee maker which has a heating element in the base. •Let your coffee 'bloom’: When you add your coffee to the French Press, add only a little hot water first, just to cover the coffee, then stir before adding the rest. 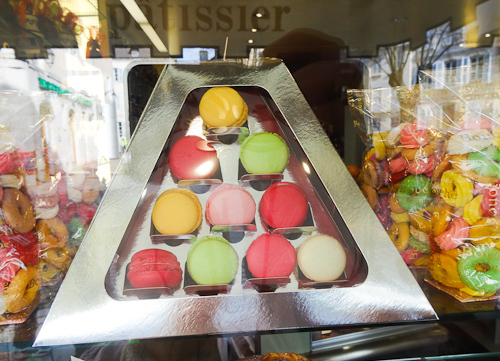 This allows the coffee to 'bloom' releasing all the trapped aromas. No strong feelings about this. •Stir in a cross pattern: When stirring your French Press, stir in a cross pattern rather than round and round. 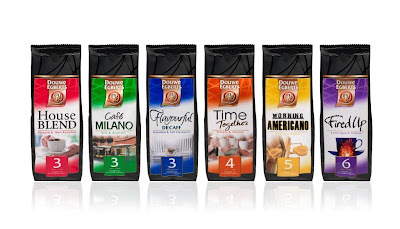 This ensures all the coffee grounds are agitated and gain maximum exposure to the water. Again, I couldn't really taste any difference. •Never use boiling water to make coffee: This burns the coffee grounds and gives the coffee a sour, burnt taste. Once the kettle has boiled, leave it for one minute, which should allow it to cool to an optimum brewing temperature of approximately 90/95 degrees. We NEVER do use boiling water whether it's ground coffee or instant coffee. •Add lemon or salt: If you drink your coffee black, adding a slice of lemon to the French Press with a lightly roasted coffee will bring out the citrus notes in the coffee. Similarly, adding a pinch of salt to a French Press of dark roasted coffee will highlight the dark caramel and nutty flavours. Still to try this sounds intriguing. •Wait! Once you've filled and stirred your French Press, leave it to brew for at least three minutes. After that, break the crust to let most of the grounds sink, scoop any remaining grounds off the top, put on the lid, plunge and enjoy! Absolutely! •Use the groundskeeper from your OXO French Press: Once you've finished your coffee, you can remove the grounds with no mess using the OXO groundskeeper, and re-use them for all sorts. Coffee grounds make great fertiliser and if you're feeling brave, can even be added to shower gel as an exfoliant! Mine goes into the compost! •Keep your French Press clean: Coffee is full of oils, which is why it has such a special aroma, but the oils also get everywhere, so make sure you clean your French Press after every brew otherwise the oils left behind can go stale and taint your next coffee. This is a good tip, but it would have been better if the French Press was dishwasher safe. •Don’t wait! After your first cup, don't leave your French Press for too long before drinking the rest of your coffee. Coffee (like all hot drinks) will go stale if left brewed for too long. Any more than an hour and you'd be better off brewing fresh, to get the best cup! This is a top tip, it will cool quickly as well as becoming slightly bitter and stewed. •Take the plunge: When you plunge, make sure you plunge straight down and not at an angle otherwise you will end up with coffee grounds in your coffee cup. We still found a few coffee grounds, although cleaning the French Press was much easier than with other cafetieres. OXO UK have a French Coffee Press up for grabs on their Facebook Page it runs until this Thursday, 21st March 2013. 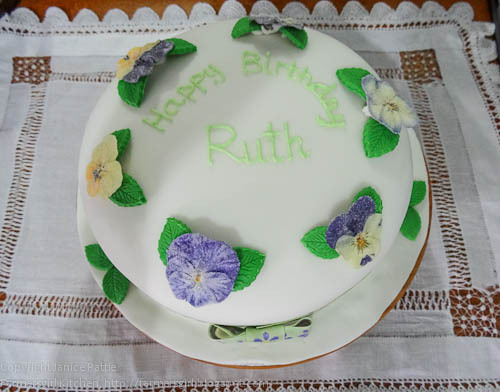 I don't often make decorated cakes, but with my mother's 80th birthday coming I knew that something special would be expected. Let me just say that my mother is a superb baker and cake decorator and has won competitions through the ScottishWomen's Rural Institutes (the Scottish equivalent of the WI). 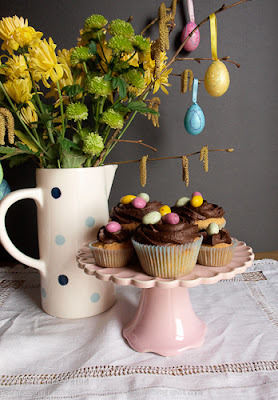 I picked up a copy of March, Making Cakes and Bakes for a bit of inspiration and, not only found the Easter Cake by Izzy Pink which inspired the design of the cake, but also a little feature article on Meadowsweet Flowers. Meadowsweet Flowers sell crystallised flowers for cake decoration and as my Mum loves adding edible flowers to salads and is particularly fond of the little 'faces' of pansies and violas, I ordered a mixed box of violas to decorate the cake. 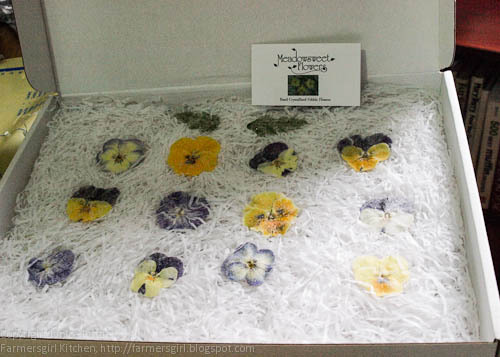 The flowers come beautifully and carefully packaged, in fact they are double boxed and all arrived intact. I dare say if I had had more time I could have made my own, but it was lovely to be able to get them like this. I made the cake last weekend and froze it so I could get straight to decorating today. I used the Vanilla Birthday Cake from Jo Wheatley's book 'A Passion for Baking'. As you can see one of the sponges had a little bit of damage, but you would never know by the time I had finished! 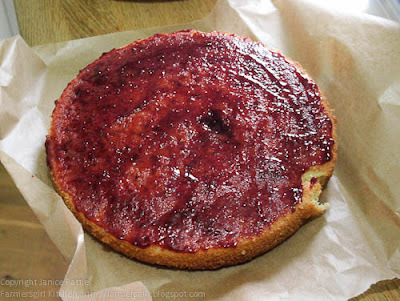 I sieved some of my mixed berry jam and spread it onto one of the sponges. I covered the other sponge with white chocolate buttercream (recipe also in March Making Cakes and Bakes) and placed it on top of the sponge with jam. 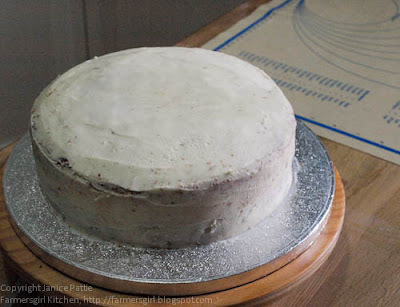 Then covered the top and sides with the buttercream. You will see that I have managed to resurrect my mother-in-law's Kenwood Chef. I got it checked out and it technically it is absolutely fine, I was told that it just needed to be used regularly! So I'm doing my best. 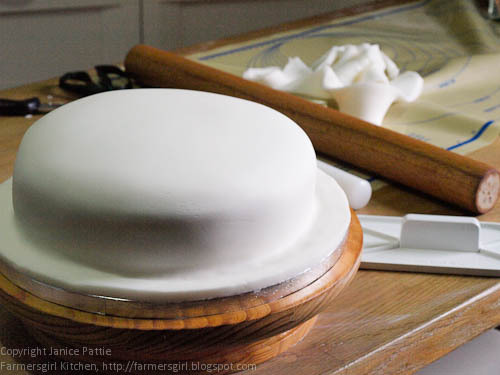 I warmed my palette knife in hot water to smooth off the buttercream ready for the fondant. I was amazed at the difference it made to have proper 'icing smoothers' borrowed from my friend Rachel of Rachel's Cakes. I'll definitely be getting my own now. Here is the rather messy 'work-in-progress'! 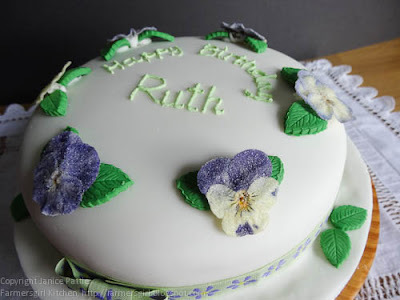 I am not well practiced at piping and writing in icing. I had a little practice and then decided to go for it! When I had finished I was quite shaky, I just didn't want to mess up after all that work. Aren't those flowers just gorgeous? 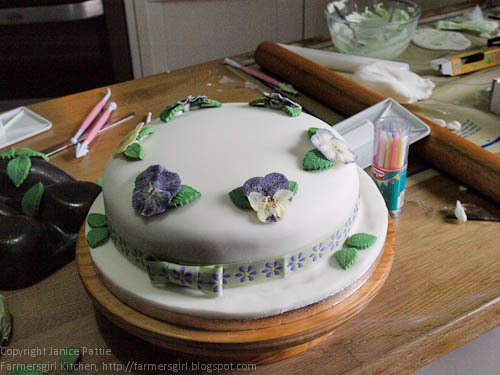 I made the leaves from green fondant last weekend and left them to dry out during the week, that worked well. 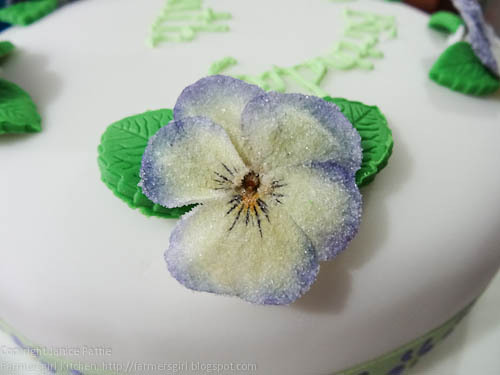 The leaves and flowers were fixed with royal icing made from the ready made mix from Sugar and Crumbs which makes it easy to make up small amounts. Now all I have to do it transport it to my mother and wish her happy birthday. There is pasta and then there is PASTA! I didn't realise just how different good quality pasta could be until I was asked to review Garofalo Italian Pasta. Garofalo Pasta is created from only the finest durum wheat in Gragnano, in the shadows of the ruins of Pompeii, where Garofalo has been making pasta for more than 300 years combining the art and skill of traditional Neapolitan pasta making with the latest technology to create artisan style pasta without equal. You know how some tastes take you right back to your childhood? 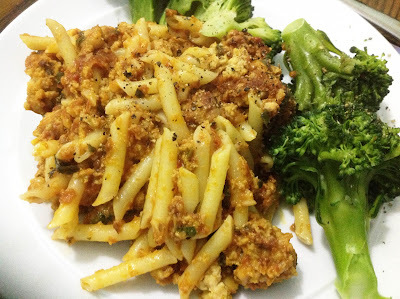 I was really rather surprised that I had that flashback when I cooked this Garofalo pasta but it tasted the way pasta used to taste and it wasn't just the taste, it was more about the texture. When you cook standard pasta al dente, it tends to still be a little bit hard in the centre and if it goes past that stage it is generally a bit soggy. 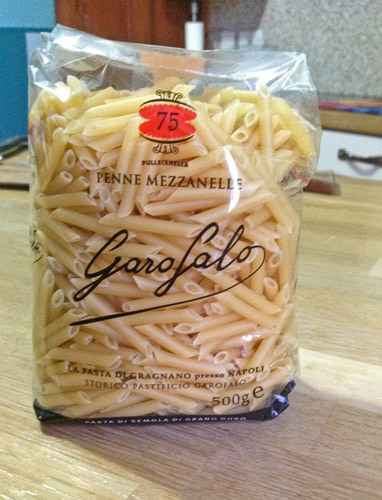 The difference with Garofalo pasta is marked. The penne mezzanelle held their shape well and had real bite, I can't remember the last time I enjoyed pasta so much. I served my pasta with sausage and chickpea meatballs with feta, a recipe I found in the March Delicious Magazine, it's showing on the website but the link isn't working at the moment :( Hopefully it will be fixed soon. The meatballs are made with crushed chickpeas, pork sausages and feta cheese. They are fried and served in a tomato sauce. The recipe makes very light delicate meatballs, they are inclined to fall apart but that doesn't really matter as they combine beautifully with the sauce. Looking to see where you can purchase Garofalo Pasta it seems that it is available through Ocado - Costco - Sainsbury - Harrods - Independent deli's and retailers and selected wholesalers. As I don't have easy access to any of these suppliers I looked for an online supplier and found it at Weetons. We all know that fish and chips is a healthier takeaway option than other choices like pizzas, burgers or kebabs. If you live in the countryside like me, it's not easy to access takeaways, they don't deliver you have to go and collect! That's why I prefer to keep some breaded cod or haddock in my freezer along with some oven chips and frozen peas. 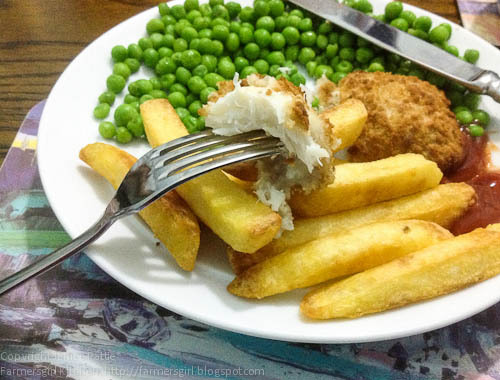 In 30 minutes you can have a comforting plate of Fish and Chips ready and on the table. Fish is the Dish has been educating people across the UK about the health benefits of eating fish for over a year now, and they are delighted to announce that after months of hard work, their Healthy Happy Hearts Challenge is finally complete and underway! It's St Patrick's Day on17th of March, and this year it falls on a Sunday, so I expect more people than usual will be celebrating this popular Irish Saint's day with a bit of feasting and partying. What better way to celebrate than with some lovely Irish produce, like this Burren Smokehouse, Cold Smoked Organic Salmon with Whiskey, Honey and Fennel? The Burren Smokehouse was first established in 1989 by Birgitta and Peter Curtin. 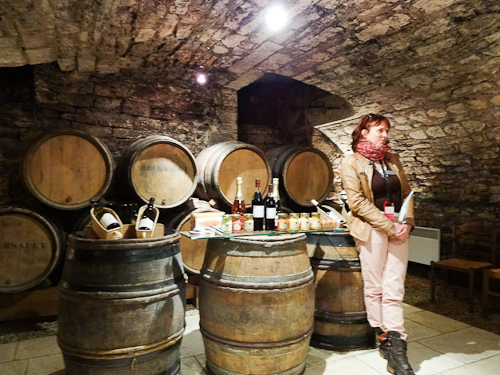 They researched the smoking traditions in Ireland and in Sweden and the idea of the Smokehouse was born. 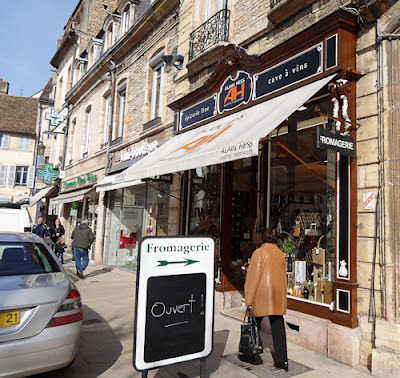 I served the smoked salmon for lunch with salad and some Bessy Beck Smoked Trout pate and some lovely Lakeland Walnut and Treacle Loaf and Rye bread with Figs and Walnuts that I bought from More? The Artisan Bakery at the Marmalade Awards. The salmon was delicious, smoked salmon is one of my favourite things to eat and I have tasted a LOT of different kinds. I would thoroughly recommend this organic salmon which won the 2 star Gold Award at the Great Taste Awards 2010 and picked up three other awards at the same show. It had just enough smoky flavour, a little sweetness from the Whiskey and honey and just a hint of the aniseed flavour of the fennel. Enjoy some Irish produce for your St Patricks Day feast. I was provided with the Smoked Salmon as part of a hamper of Irish produce, I bought the bread, salad and Smoked Trout Pate. I was not paid to review these products and all opinions are my own. I love seafood, it is probably the thing I would choose when eating out over any other type of food. While I cook and eat prawns and fish quite frequently I have never actually prepared mussels from scratch before, it was a bit more time consuming but the mussels were much tastier. I'm taking part in an initiative organised by Fish is the Dish called Healthy Happy Hearts Eating seafood gives great health benefits, in fact there is a whole section of the Fish is the Dish website dedicated to them http://www.fishisthedish.co.uk/health Health benefits include better heart, brain development, muscle repair, good skin and hair and so much more. The Food Standards Agency and experts throughout the world recommend we eat two portions of fish per week, one of which should be oily fish. So I've signed up to do just that and tell you about how I get on. My first dish is a Seafood Risotto containing, mussels, prawns and salmon fillet. The risotto was delicious, adding coconut milk to the mussel liquor and fish stock made the rice rich and creamy. If you buy mussels already cooked and shelled, they are generally a bit rubbery and tasteless. These were soft and sweet and adding the salmon at the end so it just cooks in the heat of the risotto makes it soft and flaky. 1. Put the mussels in a large pan with a dash of water over a high heat. Cover with a tight-fitting lid and steam for 4-5 minutes until cooked; discard any mussels that remain closed. Strain the liquid through a fine sieve into a clean pan. Refresh mussels under cold running water and reserve. 2. 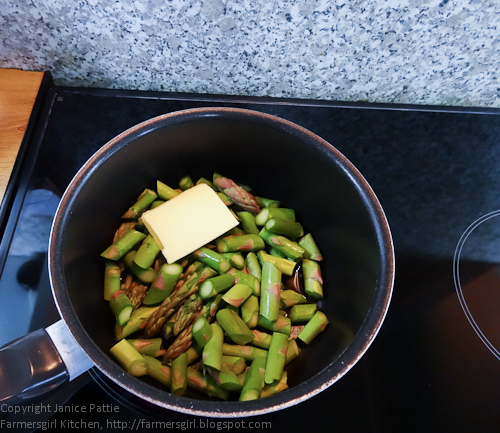 Melt the butter in a large pan and fry the onion with the garlic and spices for 10 minutes until softened. Add the rice and stir-fry fr 1 minute until glossy. 3. Add the stock and coconut milk to the mussel liquor; bring to a simmer. 4. Add the tomatoes to the rice, then start adding the coconut liquid, a ladleful at a time, stirring constantly. 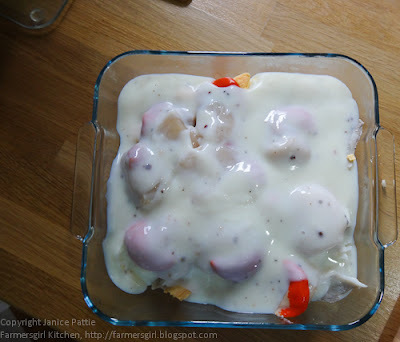 Continue in this way, allowing each addition of the liquid to be absorbed before adding the next, for about 20 minutes. 5. Add the prawns, squid, tomato and peas with the remaining liquid; cook for 5 minutes. Remove from the heat. Stir in the mussels, coriander and lemon juice. Cover the pan and leave to rest for 5 minutes. Check the seasoning before serving. I was recently contacted by 'Greener Scotland' to take part in their campaign to make Scotland a Greener place. Greener Scotland’s message is simple: when we all get involved in something it can make a big difference and by living greener, creating our own individual Greener Scotland plans and working together we can make Scotland a better place to be with cleaner air, warmer homes, less noise and pollution, as well as better health and fitness for the nation. I have planned my menus and shopping lists for many years and enjoy being creative with leftovers,finding that the leftover dishes are often better than the original! 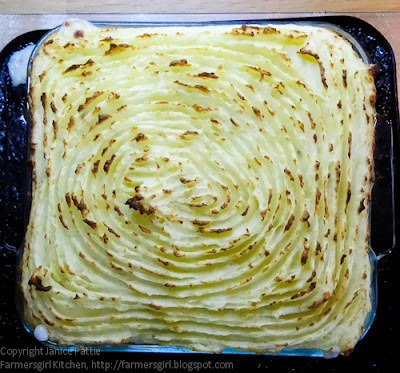 I'm also a frequent entrant to the 'No Waste Challenge' a blogger's challenge originated by Kate at Turquoise Lemons and this month being hosted by Elizabeth, the Shetland-dwelling, blogger at Elizabeth's Kitchen. The theme this month is 'eggs' and I had two egg whites left over from something (can't even remember what!) I made last week, lurking in the fridge in a bowl covered with clingfilm. Although it was Mother's Day today, we had too much to do today to take my mother-in-law out (it was also extremely cold with snow flurries) however, she does like meringue so I thought I'd make a little mini Pavlova. The recipe I use is very simple, usually it is three egg whites to 6oz caster sugar (somehow, for me, meringues are measured in imperial rather than metric) that's 2oz of sugar for each egg white. Beat the egg whites until stiff, add the sugar a spoonful at a time and then add 1 tsp of cornflour mixed with a tsp of white wine vinegar. Spread the meringue mixture into a round on a sheet of baking parchment and place into the oven heated to 160C, turn down to 150C and bake for 30-35 minutes. Shut off the oven and leave the pavlova to cool for another hour. I served the pavlova with ice cream, sliced banana and Chocolate Fudge Sauce made with 70g dark chocolate, 1 tbsp golden syrup, 1 tbsp muscovado sugar and 2 tbsp milk, heated gently on the stove and swirled over the ice cream and banana. The Chocolate Fudge Sauce is made with ingredients which are all in my cupboard and adpated from a number of different recipes most of which required double cream which I didn't have! It was not a disappointment: rich, warm and dark it was the perfect foil to the crisp meringue and cold icecream. If you would like to find out more about how you can make a Greener Scotland, check out their website.